The Doan pastures had plenty of forage in the drought of 2017 because of using soil regenerative principles. Photo by Doan family. The moment when Jerry Doan “finally got soil health” was when an Australian researcher visited his ranch, Black Leg Ranch in Burleigh County. It was the middle of summer, a hot 95-degree day in North Dakota. That meant all the regenerative soil health measures that Doan has incorporated on the ranch over the years was truly paying off. In conventional till, where the soil is disturbed, the soil temperature could read 100 degrees, and that means only 15 percent of the moisture received will go to plant growth. And if the soil temperature is higher - 140 degrees - all bacteria in the soil that supports the plant dies off. When the Doans went through the drought of 2017, they withstood it because they had great water infiltration from no-till, cover crops, plant diversity and other soil health measures, and they were able to keep the temperature down in his fields. “This is huge for us guys in the west where we are always struggling to have moisture. If we are able to keep our temperature down, and we are able to infiltrate moisture, and the plants can take it up, we can get through those droughts better,” Doan said. 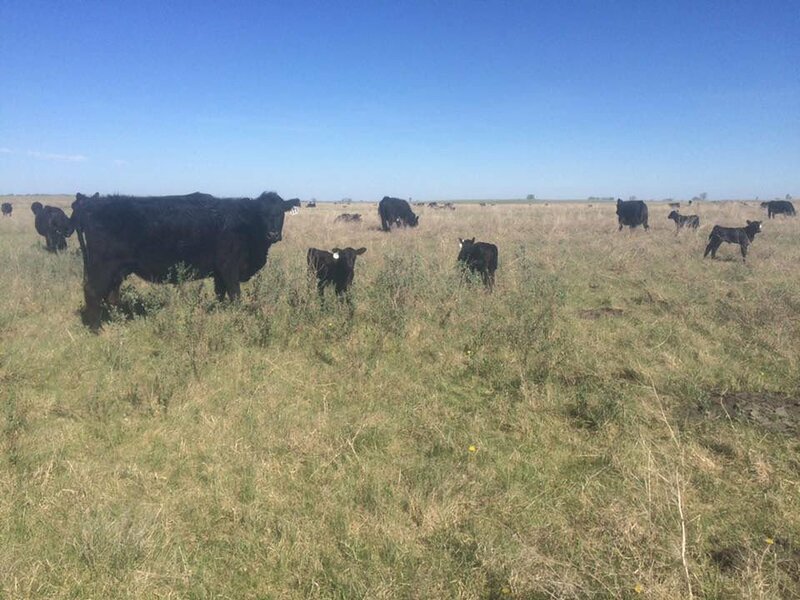 Those soil health measures implemented on the Doan ranch include cover crops, increased plant diversity, keeping a living root on the soil as long as possible, litter or residue, no soil disturbance, support for wildlife, and integrating livestock. Doan and his wife, Renae, fourth-generation on the ranch, have all their grown children, fifth-generations, and their grandkids, sixth-generation, back on the ranch (some also work off the ranch), and now one of their grandsons is even helping ranch. It is a ranch that needs to support several families. The Black Leg ranch has been in no-till for more than 20 years, winter-grazing cows for 12 years, and planting full season cover crops for 15 years. Winter grazing is key to their soil health. With their agritourism that brings people to their ranch for weddings, hunting, and having a real ranch experience with riding horses and more, they have had visitors from 40 countries and 50 states. Soon, the family will be opening a craft brewery “Black Leg Brewery” on the ranch for the tourists. Doan said at the ranch, they have become profitable from ranching holistically and following regenerative soil health principles. Besides that, he considers quality of life vital to being able to get through the challenges unique to agriculture – and especially through the bitter cold winters. Soil health has been a constant family goal to stay profitable. Doan was unsure at the beginning of going no-till, and having to commit to not disturbing the soil. Now, he says that no-till has been key to profitability on the ranch. Keeping litter on the soil does help with weeds, and it has helped Doan to cut down on inputs. Doan also believes in integrating livestock, as they spread manure on the land, and their hoof action on residue helps the biology in the soil. Doan hopes cow/calf and crop producers work together someday, where they can integrate livestock on all croplands, and cooperate on resources. When Doan started using cover crops, he had wrecks the first couple of years. They discussed if they could use cover crops to cut down on winter feed costs, and they knew a lot of their cropland was depleted. In Doan’s grandpa’s day, farmers grew wheat/summer fallow on marginal lands, which decimated the topsoil, and depleted the organic matter. That happened on every farm, pushed by government programs. Their final hope was “to propagate the wildlife,” because they needed the wildlife for the positive image of agriculture it gave to tourists. Today, they plant full season cover crops for winter grazing, mainly due to the challenge of moisture in their part of the country. “I am all for it if you can plant a cover crop after another crop,” he said. They seed the cover crops in mid-June, with the crops designed for nutrient recycling. After they learned how to plant cover crops successfully, their water infiltration and quality improved, and wildlife increased. Doan puts a lot of legumes in his mixes to build their own nitrogen, so he can cut down on inputs. For winter grazing, every mix should include a BMR corn that is a sweeter corn and good for grazing; forage collards like a cabbage plant that stays green and leafy even in snow and is very good for cows; and millets that work great in a grazing season. For instance, one year cowpeas were very expensive, so they took them out of the mix for a couple of years. They had to take sunflowers out completely because the blackbirds were not only eating all the sunflowers, but were taking the millet, intended for their livestock, out, too. Doan showed his cover crop field last fall, which was beautiful and chest high. Some of the Doan’s goals change, as they figure out different and more profitable ways of integrating their livestock with cover crop grazing. Currently, they are trying to add perennials into the grazing rotation. That would cut down on the need to plant every acre for grazing every year. They do have alfalfa and other hay, but that is for backup hay bales, not grazing. “We seeded western wheatgrass, alfalfa, milk vetch, and collards, and our goal was to see if we could take a hay crop and graze it before we graze the cover crops,” Doan said. They had a bromegrass pasture that they wanted to get rid of. The cows don’t like brome; it does not attract pollinators and it doesn’t produce much hay. They tried hitting it with glyphosate. “We had some cider milk vetch in the lower areas and hoped it would spread that seed across the landscape,” he said. They put 900 pairs in there in the fall of 2017, watching to see if they could spread that vetch over the pasture. “Last spring, I started to see little patches (of milk vetch) crop up. Milk vetch is a non-bloating legume that will offer you some early season grazing,” Doan said. The family’s goal is not to graze cover crops until December or even later in the winter. Cows stay on native range or crop aftermath as long as possible. That savings also includes seed costs, equipment cost, land rental, and other costs to raise the cow, not just the feed. Unfortunately, this has not worked this year. With the extreme cold, the Doans have been feeding hay to their cattle out on the land. They keep their cattle out on the land as nature intended along with calving in the pasture, which is why they calve later in the year, in May/June. “We try to leave 50 percent (of the residue) for the soil, and that is hard in the snow,” he said. They participate in the Nutrition Balance Analyzer program from Texas A & M, which analyzes manure for forage nutrient analysis, a good way to measure if cows are getting enough nutrition. “Whenever we run the cows on cover crops. They keep some of the best cover crops for the third trimester. “Our cows are not getting fat, but they are not losing weight, which is what we want,” Doan said. He wants his cows to be about 1,100-1,200 pounds in size. Doan said they never bring their cows into the watershed area or into a corral, and they have good water systems to keep their cows out on the land. “Keep the cows on the land; keep the biology out on the land,” he said. - Only need to put up about 800 bales, which are only used in severe winters, such as this year. - Need less haying and feeding equipment. - Less time needed hauling manure, feeding, spreading manure and haying. - Less dollars spent in fuel and machine repairs. - Less wear and tear on equipment. Because of severe winters, the Doans always have a backup plan in place to use if needed. “This year, we started to feed hay at the end of January. This winter, the fourth coldest since records have been kept, was too bitter and the wind so severe, and the cows couldn’t stand it,” he said. Doan found that in the severe wind chills, his cattle did not want to walk to the water, so they need to have portable water as a backup. Doan plans to put them back on the cover crops in another couple of weeks. When there are challenging years, and Doan loses cattle, it can be depressing. But he has been told if he could not afford to lose cattle, he should not own any. The other thing he was told is to step back and see the big picture. “You are managing holistically. It is hard when you are living in it, but we do need to step back from it and see it as a whole,” Doan said.